ALL CDPHE EMPLOYEES – especially straight allies welcome and encouraged to attend this first-ever professional development opportunity! 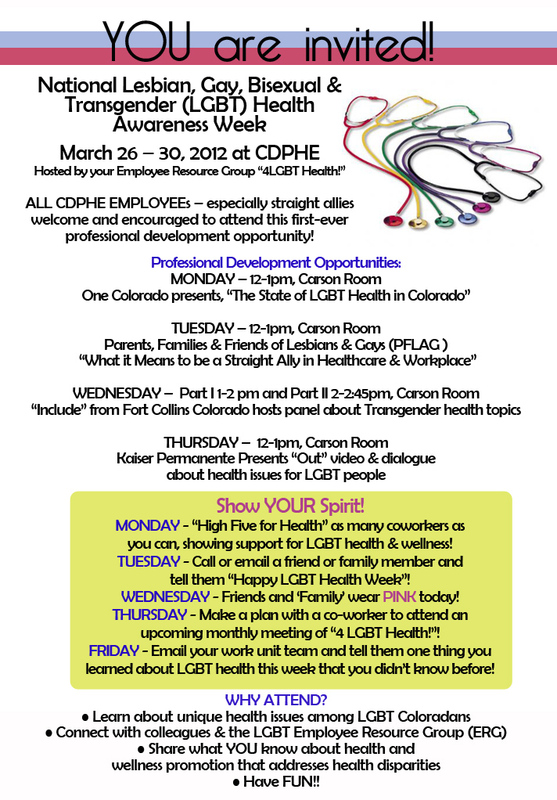 MONDAY - “High Five for Health” as many coworkers as you can, showing support for LGBT health & wellness! TUESDAY - Call or email a friend or family member and tell them “Happy LGBT Health Week”! WEDNESDAY - Friends and ‘Family’ wear PINK today! 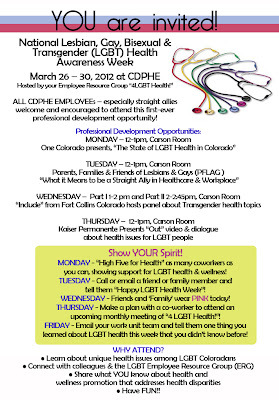 THURSDAY - Make a plan with a co-worker to attend an upcoming monthly meeting of “4 LGBT Health!”! FRIDAY - Email your work unit team and tell them one thing you learned about LGBT health this week that you didn’t know before!